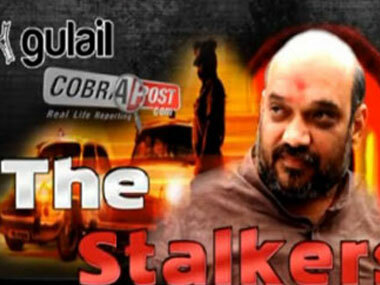 Audio Tapes reveal Amit Shah ordering an illegal surveillance of a young woman from Bangalore in 2009 for his “Saheb”. The police snooped around the woman wherever she went, malls, gyms, restaurants, hospital, took a flight or checked into a hotel. Since people like Shah and Chudasama constantly reassured him that their actions had Modi’s blessings, Singhal indulged in various illegal activities. Says Singhal in his statement to the CBI, “I restate the fact that previously I had been coerced to participate in and help in certain activities intended to obstruct the process of law. Although illegal, unethical and improper, I had not declined to follow instructions because I was under a cloud in this case and Shri Amit Shah used to wield his authority by making it appear that I and my subordinate officers were being protected from incarceration by his and the Chief Minister’s efforts”. At this point of time, Gulail and Cobrapost have no means to independently verify these charges. Below are some of the transcripts of the audio files submitted by GL Singhal to the CBI. Viewers are advised that the audio files have been transcribed as diligently and accurately as possible. Transcribing is painstaking and error-prone work. It involves hearing and typing. In case of any discrepancy, the audio files should be referred to. Viewers are further advised that Gujarati language has been translated to English with utmost care (We have tried to retain the original meaning of all the conversations to the best of our ability within the inherent limitations of translation). Errors, if any, in transcribing and translation, are purely bonafide and unintentional. It should be remembered that subtitles are only an aid to the hearing process. Amit Shah: She must have gone. Saheb comes to know of everything. Amit Shah: She must have gone. Saheb comes to know of every thing. G.L. Singhal: Sir, I have seen the place and the hotel as well. Men are well deployed and all arrangements have been made. The moment she leaves, she will be followed. One man is on the main road and another in the front. Amit Shah: Have it confirmed and inform…. Amit Shah: That is ok but is she inside? Amit Shah: And also moved out along with that boy who came to see her……. G.L.Singhal: Yes sir…… Security has been placed in such a way that our men have to go there ostensibly to make enquiry about car insurance. But our men keep going there every now and then. They are not letting our men sit inside. Amit Shah: But there are only two doors ? Amit Shah: But they even went for shopping…. G.L.Singhal: Yes sir., they might have gone in tinted glass car so our men might have missed. Anyhow I will again tell the people deployed. Amit Shah: Singhal… Any updates ? G.L. Singhal: Good enough Sir!! G.L.Singhal: Would you please tell me the location of our BMC, Municipal Commissioner secretively ? Amit Shah:: What happened at night ? Amit Shah: So today deploy 8 to 10 men firstly, that man is going to stay at Kuldip’s house… There … then he has called a Bhavnagar Municipal Corporation car. Amit Shah: And the---- matter… keep a watch the whole night. Amit Shah: Did you talk ? G.L.Singhal: Sir… I have talked to them but even then I’ll talk again. Amit Shah: They have left ? Amit Shah: So…did they go for lunch or something ? Amit Shah: Still at theater, no ? Amit Shah: Oh, is it ? Amit Shah: How did Vaishnav come to know ? Amit Shah: Ok…Vaishnav is also working on this? Amit Shah: Who all are there ? Amit Shah: And Vaishnav is also there ? Amit Shah: Who is going to takecare of the phone ? Amit Shah: Don’t let Vaishnav do that work, ok ? Amit Shah: And…you yourself also keep a tab. Amit Shah: And…you got that thing ? Amit Shah: And the people with the placard…. G.L.Singhal: Yes, I am trying to establish some link with the manager. Till tomorrow morning I would be able to find some. Amit Shah: Any information ? Amit Shah: Any news ? Amit Shah: Hmm…, Is there any guest house inside ? G.L.Singhal: I will check sir… ok ? Amit Shah: Ok… , She is still there only ? G.L.Singhal: It is in the name of Sarojben, Saroj Mahendrabhai….? Amit Shah: But some Mahendrabhai …lives there ? Amit Shah: What is the location right now ? Amit Shah: Where is she now ? G.L.Singhal: The thing is that she came here to meet someone and it is heard that there is something pertaining to engagement and for that she came to meet that boy. Amit Shah: Hmm…And on phone ? Amit Shah: At that man’s place ? G.L.Singhal: Yes sir. At his place. She received call at 8:30 am and was asked that at what time she would be coming . She said she will calln in the afternoon or evening but then she called on her own and said she will come at 11:30.The boy may be called. Amit Shah: Hmm…., so all these talks are of before 11:00. Amit Shah: So phone is off after 3? What were the other calls made before 3:00 ? G.L.Singhal: Sir it seems that 2-3 calls were by her to her Banglore colleagues--- “where are you” and “did you reach safely?” All that..And some talks about hotel reservation. Amit Shah: Are they talking in Gujarati ? Amit Shah: And any talks with her family ? G.L.Singhal: No sir she talks very rudely with her mother. Amit Shah: Hmm… And who is that Mahendrabhai ? G.L.Singhal: That has to be checked. Our men are deployed at both front and rear gates. But it does not appear that he is her relative but he might be in her group. Amit Shah: Hmm…, Deploy some persons at his place. G.L.Singhal: 2-3 calls are from Bangalore. She is asked where is she. She calls up the hotel and takes the address and tells that they are about 70 kms away. She goes to the hotel and again receives a call from Bangalore. And at 2:35 am one call is made in English and that also appears to be from Bangalore. Amit Shah: What is the call all about ? Amit Shah: Hmm…, hmm…, So check that reliance number. Amit Shah: Hmm…, Check with the company. G.L.Singhal: Sir I talked to Harish but he told there is some problem in Mumbai server. Amit Shah: Hmm, so she is in the flat only ? Amit Shah: Anything special on other phones ? G.L.Singhal: Around…sir…22-24 files are there. 2 files are repeating so 22 files are there. Amit Shah: Where is that woman right now ? Amit Shah: Enquire about it. Our men are there only isn’t it ? Amit Shah: Its hasn’t been switched off, isn’t it ? Amit Shah: But You have asked him as our people ? Amit Shah: What did your men tell ? Amit Shah: Is there only one door or any other than that ? Amit Shah: Where are you ? Amit Shah: Which Office ? Amit Shah: They haven’t come out, isn’t it ? Amit Shah: Singhal, did you check ? Amit Shah: Check whether they are there or not ? G.L. Singhal: Actually we also tried to lay a trap at night pretending to be calling from a travel agency and asked whether a guest called Nancy D’Souza is staying in that room ? But they confirmed that no one with that name is staying with them but they told that someone called ----- is staying in that room. But that girl is so clever that when she was returning from the airport someone gave her a missed call then she called back on that number and started asking who has called. But it was told that it was a public booth. She started asking who had called and how was his/her appearance. Amit Shah: Okay. And the other thing is that it is required to take the bill print of this number and that 240 number. So what to do? Amit Shah: Mr. Sharma has come today ? G.L. Singhal: Sir… I have already called for a car. And sir I will make it placed below the block itself along with the car and our men. G.L. Singhal: Sir… I have positioned (men on) two motorcycles and a person is sent in a car. They will reach in 10 minutes. G.L.Singhal: Yes Sir…they have left and are going towards Sterling only. Amit Shah: In 328… ok ? Amit Shah: Yes Singhal…what news ? Amit Shah: That means… from the hospital ? G.L.Singhal: Secondly sir… I have also asked for the CD of CCTV Footage of four five hotels there. And sir I also called for cctv camera footage that are installed near hotels on highway. Amit Shah: Means….please don’t doze off at night…..
Amit Shah: She is with that boy or with family ? Amit Shah: The boy is also there ? G.L.Singhal: No one else, just that girl sir……..
Amit Shah: What is the name of restaurant ? G.L.Singhal: Havmor which is behind the Navarangpura bus stand sir…..
G.L.Singhal: I will check it sir….our man is there at the Hospital only. G.L.Singhal: Sure sir…..i will ask about it as well…. Amit Shah: Santro car ? Amit Shah: What about that man ? Amit Shah: Weren’t they followed from the hotel ? Amit Shah: I will go via hospital. See if they come down at night. How many persons are deployed there ? Amit Shah: What time ? Amit Shah: No one came to meet ? Amit Shah: Ok Where is this Debark ? Amit Shah: Who else is accompanying ? G.L.Singhal: Ya sir… they are there only. Amit Shah: Check out which flight is booked ? Amit Shah: Any in afternoon ? Amit Shah: To Bangalore ? G.L.Singhal: No movement sir… And I got all flights checked to Bangalore. Not booked in any. Let me check now for Mumbai flights may be can find some bookings. Amit Shah: Since not able to see on phone now, keep proper watch, should not escape. And ask Asari whether that man is still in Bhavnagar. Amit Shah: I got to know that their ticket was of Jet in the afternoon. It was not cancelled also. Amit Shah: Whether it was through cash or credit card or by any agency. You will come to know through the codes mentioned on ticket. Amit Shah: After that they are at home only ? Amit Shah: Did you take location of Bhavnagar ? Amit Shah: When was the last time when that woman was seen by our men ? Amit Shah: Did someone see her in afternoon ? She may have gone away in the morning ? Amit Shah: At what time was she seen ? Amit Shah: Could you know the name of the Gym ? Amit Shah: Still there only ? G.L.Singhal: Sir.. Sir….the lady isn’t it sir? Amit Shah: Yes check out what flight it could be in the evening…. Amit Shah: May be GoAir. And has that man reached Bhavnagar ? G.L.Singhal: Yes sir…he has. I have checked out his location and he reached last night. G.L.Singhal: Was seen with her bhabhi near Drive-in for shopping and now reached back. Amit Shah: As such stays back at home only ? Amit Shah: Ok… and that guy from Bhavnagar … and his location ? G.L.Singhal: Sir… don’t bother right from 5.30 in the morning our staff is on duty there. Amit Shah: You will get it from Jet ? G.L.Singhal: Yes sir and the flight took off as well. Our people would be their for an hour more as they might play any mischief and come out. G.L.Singhal: ok I will send it sir…. Amit Shah: then Shanti is Narmada’s Deputy Collector…. Amit Shah: then Tyagi is Airport officer…hello? Amit Shah: and one Vidyarthi,DDO of Amreli…. Amit Shah: A k Sharma has come or still on vacation? IG: Then I think that must be his voice because that voice was a bit doubtful… and…he said that he would eat together. He was talking about lunch. GL Singhal:sir it is Skoda car with GJ registration, GJ-1HD 7959. IG: which Chaar Raasta ? G.L.Singhal:There is a new restaurant at the corner…Italian restaurant Amazo. IG: Italian restaurant, Can we click the photo of that boy? G.L.Singhal:sir I have already given camera for that but actually due to darkness…... Pen camera is also given. IG: what are our people doing inside ? IG: ok I will know it. G.L.Singhal:his booking in hotel is till 11. IG: ok yes…that means till tomorrow. Amit Shah: Does she goes out ? Amit Shah: And what else she does ?